A steady rise of water at the bottom of your shower stall or tub is a clear indication of a clogged drain and is often due to an accumulation of hair, soap scum and dirt. The best way to clean your shower drain is with natural household products, as drain cleaners are both toxic to the environment and to you if inhaled, and they can gradually erode your pipes. A natural drain cleaner breaks up clogs without the unpleasant odor and is nontoxic to handle. Natural cleaning products are ideal for clearing a clogged shower drain. Scoop out standing water with a plastic cup or bucket, and wipe away as much dirt and oil as you can around the surface of the shower drain. Pour 1/2 cup of baking soda into a measuring cup, and pour the cup's contents directly into the drain. Rinse out the measuring cup, and pour 1/2 cup of white vinegar into the cup. Pour the vinegar into the drain to start the cleaning process. The mixture of white vinegar and baking soda loosens up clogs and clears the plumbing within 15 minutes. Turn on the faucet's hot water to the highest level to push the vinegar and baking soda residue through the pipes. Keep the water running for three minutes, and turn off the faucet. Pour 1/2 cup of lemon juice down the drain to neutralize foul odors that may rise up from the plumbing during the cleaning process. 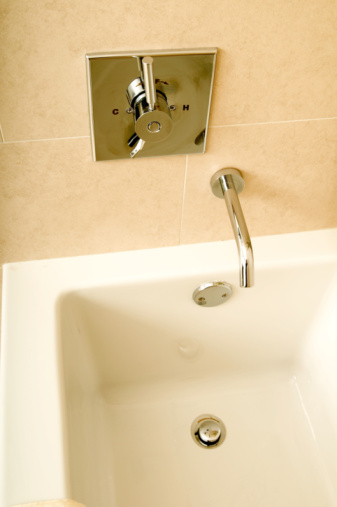 Repeat the cleaning process once a month to keep your shower drain free of buildup.